The final pass of transiting Pluto over the Bitcoin Sun is basically upon us (the first exact hit of this series is next month). This tends to wake Bitcoin's price movement from its slumber and bring the wild price fluctuations we've come to know. The price has risen sharply over the past month by about 25% to over 300USD; in the past day it has dropped a bit down to around 280USD. I think it's transiting Mars opposite transiting Pluto and the Bitcoin Sun that's helping to trigger the activity. The recent quincunx to Sun/Pluto from the transiting Moon may account for the drop. If that's correct, we may see some more upward movement pretty soon... but eventually these Pluto events bring steep crashes the timing of which I can't predict with accuracy. 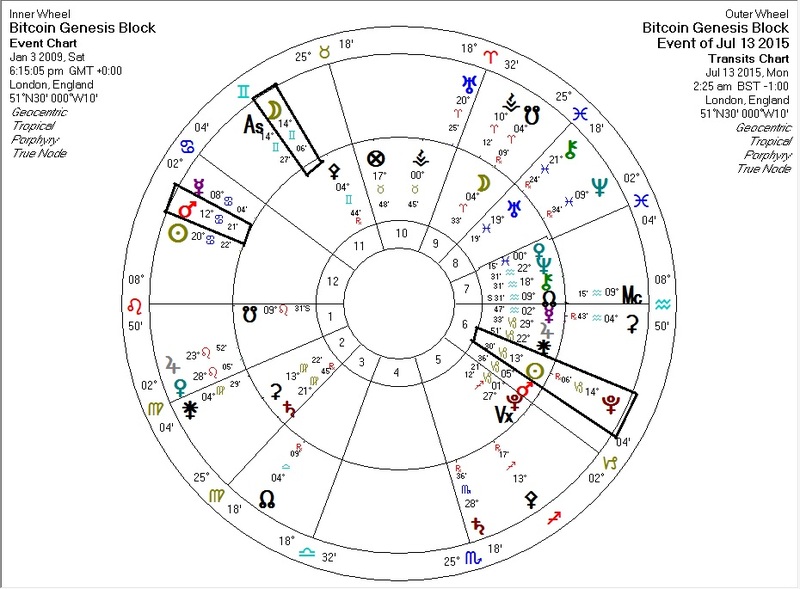 Here's the chart for transits against the Bitcoin chart at the peak of the Moon aspect to transiting Pluto. The "real world" news driving this activity might be the Greek tumult and the UK's proposed encryption ban.